AudioSlides are a great way to give readers your own perspective on the research you have done. 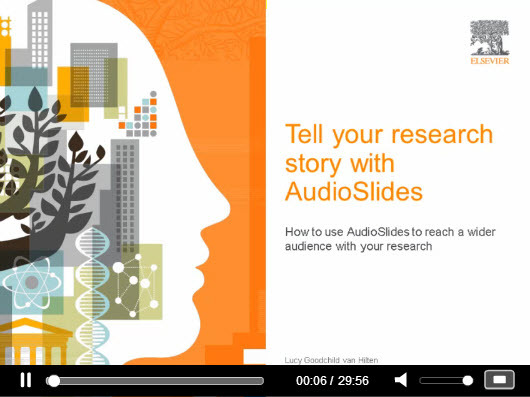 To help you tell the story of your research, share its relevance with readers, reach a wider audience and increase your presence on social media, we recently published a webinar on making the most of AudioSlides. Here we answer some of the questions that came up, and give you some of our top tips on how to make a good AudioSlides presentation. What are AudioSlides? AudioSlides are short, webcast-style presentations that let authors present their research in their own words. More than 75% of Elsevier’s journals – close to 1500 titles – support AudioSlides. Are they peer reviewed? No. AudioSlides are not part of your article, they are about your article. Although they’re not peer-reviewed, there are some ground rules you need to adhere to. These specify that your presentation is an accurate representation of your research, and that you have permission to publish them. You can take a look at the website for more details. Can I create AudioSlides for a non-Elsevier journal? No – this is an Elsevier Content Innovation and is only available for Elsevier journals. How do I know if a specific journal offers the AudioSlides option? 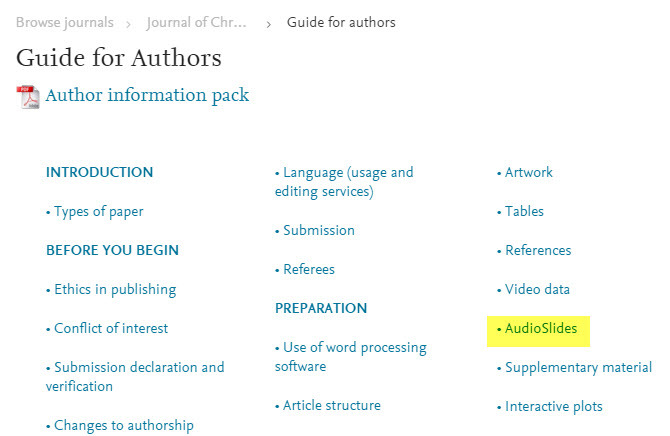 Click here and enter the name of the journal and choose “AudioSlides” in the “Filter by content innovation” field. You can also see it on the journal home page or by reading the journal’s Guide for Authors. Is it mandatory to create an AudioSlides presentation? No, it’s not mandatory. But it’s a great opportunity to enrich your article and attract more readers! Can I create a presentation for an article that’s already published? If you have published an article in a participating journal in the last 12 months, you can contact Researcher Support to find out if it’s possible to create an AudioSlides presentation. Does Elsevier own the copyright for AudioSlides presentations? No, that remains with you. The presentation is made available under an Open Access CC-BY-NC-ND license, so that the presentation can be freely re-used for any non-commercial purposes. Are there any costs involved? Absolutely none – AudioSlides are free to view, and there are no costs associated for you, the author. Will AudioSlides increase my article downloads? There is a correlation between AudioSlides and article usage, with articles that have accompanying AudioSlides presentations being read more. While it’s difficult to show the direct effect of the AudioSlides on usage, articles with AudioSlides typically have substantially more downloads and views than similar articles without AudioSlides – as many as 50% more! We observed that this increase in usage is particularly strong when authors actively use their AudioSlides presentations to promote their work on other websites or social media. The effort can really pay off! Are AudioSlides popular? So far, AudioSlides presentations have been viewed more than 100,000 times; in addition to the thousands of views generated directly in the articles online, presentations that are uploaded to YouTube or embedded on institutional websites also encourage people to read the original articles. And when people see a page with an AudioSlides presentation online, more than 15% will watch the presentation. Can I see an example of an AudioSlides presentation? Yes you can. Visit the AudioSlides website and scroll down to “Benefits for Authors and Readers”. You’ll see an example there on the right. You will find further information on the AudioSlides website, or visit the Content Innovation page to learn about other innovations that help you present your research online in the best possible way. For advice on how to make a great AudioSlides presentation, check out our webinar on the Elsevier Publishing Campus. Here are some of our top tips from the webinar to give you a head start. Check your AudioSlides presentation before publishing – there’s no going back! Dr. Hylke Koers is the Head of Content Innovation at Elsevier, leading a team that is responsible for enhancing the online article format to better capture and present modern-day research. Part of Elsevier's Article of the Future program, this includes improved online presentation as well as in-article visualization of digital research output – for example through interactive plots, 3D viewers, or the award-winning Virtual Microscope. Before joining Elsevier in 2010, Hylke received a PhD in theoretical astrophysics from the University of Amsterdam and served as a postdoctoral research associate at the Université Libre de Bruxelles. He is based in Amsterdam.